Source: Bryan on Scouting, issued March 16, 2018. The BSA is serious about fighting child abuse, and you’re an important part of that fight. Thanks for your vigilance and dedication. 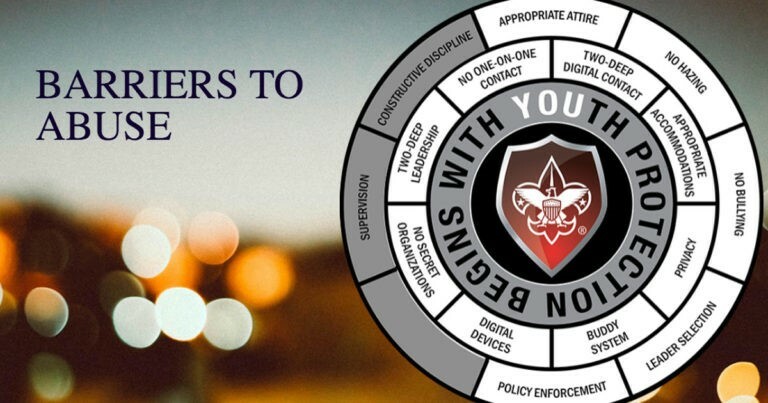 The updated course debuted in February 2018; if you took Youth Protection training prior to that, you’ll need to complete the updated course by Oct. 1, 2018. Here’s a PDF that outlines the steps. What’s updated in this Youth Protection course? Video interviews with psychologists and law enforcement professionals who discuss the root causes of abuse, how to recognize it and how to respond. Three all-new training modules and a test. No unit may recharter without all leaders being current on their Youth Protection training. No new adult volunteer can be registered without first completing Youth Protection training. No council, region or national leader will be allowed to renew his or her registration if their Youth Protection training is not current. Adults accompanying a Scouting unit who are present at the activity for 72 total hours or more must be registered as leaders. This includes completing a criminal background check and Youth Protection training. The 72 hours need not be consecutive. Youth Protection is best achieved through the shared involvement of everyone in Scouting. Educate Scouting professionals volunteers, parents, and youth members to aid in the detection and prevention of child abuse. Strengthen charted organizations' leader selection procedures to prevent offenders from entering BSA leadership ranks. Strengthen policies that create barriers to child abuse within the program. Encourage Scouts to report improper behavior in order to identify offenders quickly. Swiftly remove and report alleged offenders. Two-deep leadership required on all outings. Separate accomodations for adults and Scouts required. Members are responsible to act according to the Scout Oath and Scout Law.